The sprite-sized entryways are sprinkled around Atlanta, beckoning eagle-eyed art buffs to seek them out. Once found, there’s whimsy and wonderment in speculating what awaits on the other side. Artist and creator Karen Anderson impeccably maintains each Tiny Door and keeps us informed of new or refurbished ones via her Instagram, @tinydoorsatl. Sometimes, mini accouterments arrive on their tiny doorsteps: itty-bitty newspapers, books, plants—and tiny “Will you marry me?” messages. 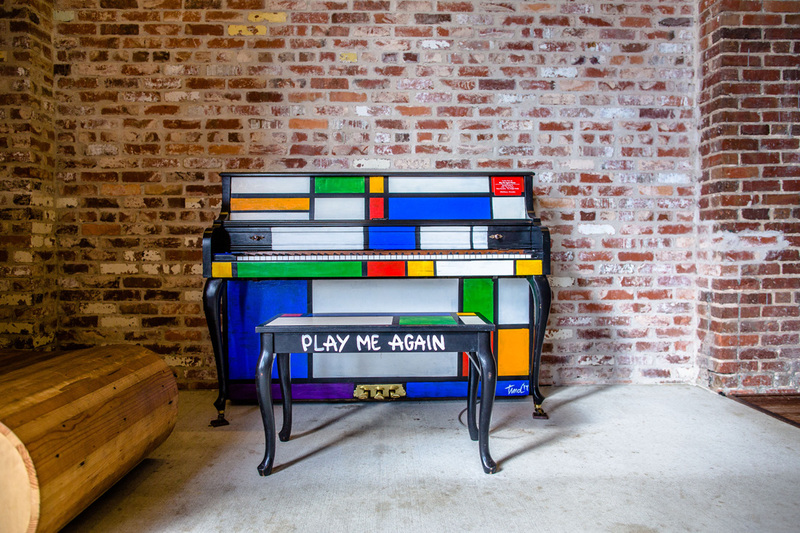 When you stumble upon a spectacular, primary-colored piano in Mondrian’s neoplasticism style while walking through Ponce City Market, it makes you want to play it—and that’s exactly what it’s there for. The instrument is just one of 88 Play Me Again Pianos positioned around Atlanta to inspire joy through music and art. Art teacher Theresa Dean painted this one, which is titled “Cornelius.” The scattered pianos will remain in place on a permanent basis, only to be replaced when they’re worn out. 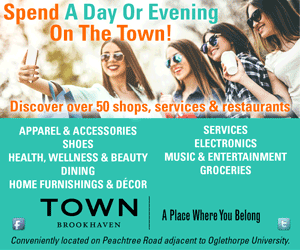 Atlanta’s Dogwood Festival began in 1936 to celebrate our city’s blooming dogwood trees. Commissioned by festival organizers in 2016 to celebrate the festival’s 80th anniversary, this bronze sculpture made its debut in 2017. 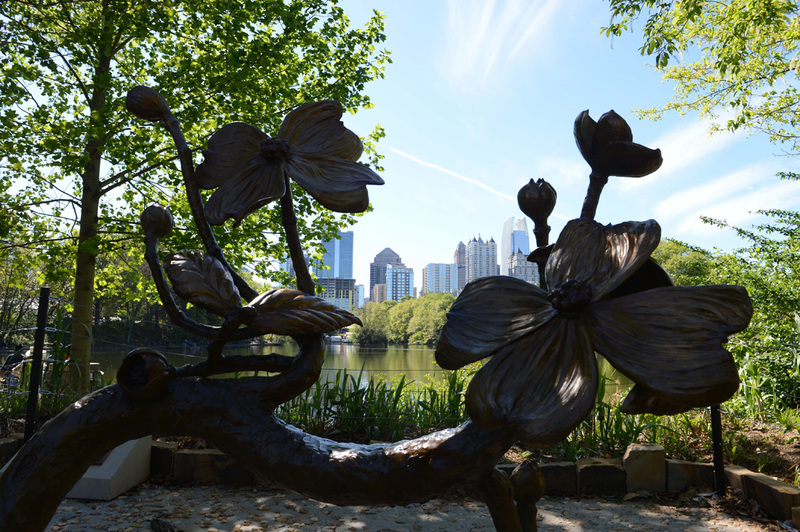 Sculptor Martin Dawe, who also created the Martin Luther King, Jr. statue at the Georgia Capitol, created the huge dogwood branch with giant blossoms. It serves as a bench, as well as a work of art, and it no doubt will be seen in many Instagram selfies. During Pride Week in 2015, temporary colorful crosswalks were painted in the streets of Midtown as a symbol of unity and support for the LGBTQ community. This July, after thousands signed petitions advocating to keep the crosswalks in place, mayor Kasim Reed responded by having colorful, thermoplastic panels installed that are meant to last for 10 years. The brilliant rainbow crosswalks now add polychromatic fun when crossing all four ways at 10th and Piedmont Ave., the heart of the city’s LGBTQ community. Take a seat inside this wood-and-plexiglass cube for a brilliant and colorful viewpoint of our city. “City Dreamers,” created by friends Tenay Gönül, an architectural designer for Cooper Cary, and Julian Quinn, principal at Pattern r+d, is situated along the BeltLine’s Eastside Trail, South of Virginia Avenue (near Midtown Arts Cinema). Views of Atlanta’s skyline are framed by a chalkboard that encourages notes from visitors to the tiny oasis that was installed this summer.